On Nov. 12, 2014, the European Space Agency’s Rosetta mission made history when its Philae lander touched down on the surface of comet 67P/Churyumov-Gerasimenko. While this exciting technical achievement gained lots of headlines, it was only the beginning for researchers back on Earth who are receiving and analyzing comet data. The latest chapter in the story provides the closest and most detailed look at a comet that scientists have ever seen. The results—including four papers co-authored by University of Maryland scientists—appear in a special issue of the journal Science, published on Jan. 23, 2015. UMD astronomers Michael A’Hearn and Dennis Bodewits co-authored three of the papers, as members of the team for Rosetta’s Optical, Spectroscopic and Infrared Remote Imaging System (OSIRIS). This trio of papers helps us to better understand how comets form in the first place, how their surfaces evolve over time and how to (potentially) predict their lifespans. “We are trying to see how a comet evolves over time, and also through the course of its orbit. Gaining this detailed time series is what distinguishes Rosetta from other missions, such as Deep Impact,” said A’Hearn, a Distinguished University Professor Emeritus of astronomy at UMD. A’Hearn served as principal investigator on the Deep Impact mission, which sent an impactor module to the surface of comet Tempel I in 2005. This mission was the first to remove material from the interior of a comet’s nucleus—the solid central lump of ice, dust and debris—and compare it to the material at the surface. The versatile OSIRIS imager consists of two cameras, each with its own set of specialized filters. The narrow angle camera is designed to image the surface of the comet’s nucleus, while the wide angle camera focuses on the cloud of gas and dust around it. One of the Rosetta papers uses OSIRIS images to analyze the structure of 67P/Churyumov-Gerasimenko, known to the mission team simply as C-G. 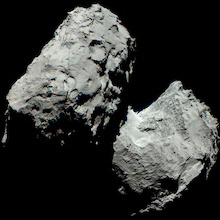 Described as roughly the shape of a rubber duck, it consists of two lobes connected by a thin “neck.” The team found that the majority of outgassing activity from the comet is occurring at the neck, where the OSIRIS cameras have consistently seen jets of gas and debris. The finding raises questions as to whether C-G formed from the combination of two smaller bodies, or began as one large body that shrank around the middle, like an apple that has been eaten around its core. A second paper describes, in detail, the surface of the portion of C-G that is currently visible to Rosetta. (The “southern” face of C-G has not been seen yet, because it is facing away from the sun.) This “northern” region makes up more than half of the comet’s total surface area. It is divided into 19 distinct regions, all named for ancient Egyptian deities in keeping with the nomenclature of the mission. Details about the textures and geomorphology of C-G’s nucleus will help the team determine how the comet’s shape has evolved over time, and where it might contain larger deposits of water and ice. This search should become easier as C-G gets closer to the sun. A third paper combines data from OSIRIS and another instrument, the Grain Impact Analyzer and Dust Accumulator (GIADA). This study looks at C-G’s coma—the thick cloud of dust and gas that envelops the nucleus. As the comet gets closer to the sun, the coma grows more massive as the nucleus heats up and loses more material. By measuring the activity in the coma, including changes in the ratio of dust to gas, the team should be able to estimate how quickly C-G is outgassing and losing mass. 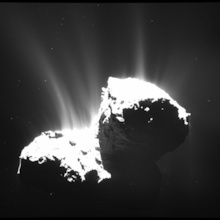 In so doing, the team hopes to learn more about how comets evolve. A’Hearn and Bodewits are particularly excited for further developments, as C-G and Rosetta hurtle ever closer to the sun. The comet will be most active when it reaches perihelion, or the single point in C-G’s orbit that is the closest and most intensely affected by solar radiation. It will reach this point on Aug. 13, 2015, after which it will head away from the sun once again. A fourth paper is co-authored by Murthy Gudipati, a principal scientist at NASA's Jet Propulsion Laboratory and a part-time senior research scientist at the UMD Institute for Physical Science and Technology. This study describes evidence for carbon-based molecules on C-G’s surface, gathered by Rosetta’s Visible and Infrared Thermal Imaging Spectrometer (VIRTIS) instrument. Based on past comet studies, the team expected to see signatures of slightly more complex molecules such as alcohols, carboxylic acids and nitrogen-containing amines. However, the evidence from VIRTIS suggests that C-G’s surface is instead dominated by simpler hydrocarbons. The discovery could have implications for our understanding of how carbon-based molecules first developed and spread through our solar system. The Rosetta mission is operated by the European Space Agency with national agencies funding the instrumentation and scientific activities. University of Maryland participation in the OSIRIS camera team is funded by NASA’s Jet Propulsion Laboratory (Contract #1267923) and a Gauss Professorship from the Göttingen Academy of Sciences (to Michael A’Hearn). The content of this article does not necessarily reflect the views of these organizations. “On the nucleus structure and activity of comet 67P/Churyumov-Gerasimenko,” Sierks et al. “The morphological diversity of comet 67P/Churyumov-Gerasimenko,” Thomas et al. “Dust measurements in the coma of comet 67P/Churyumov-Gerasimenko inbound to the Sun,” Rotundi et al. “The organic-rich surface of comet 67P/Churyumov-Gerasimenko as seen by VIRTIS/Rosetta,” Capaccioni et al.